Night eight of the sprawling ten-day Ottawa Bluesfest featured one of the best-curated line-ups of the festival, as the small, river-hugging Blacksheep Stage brought fans of sleek underground beats together to check out Ryan Hemsworth, Jacques Greene and Yung Lean. 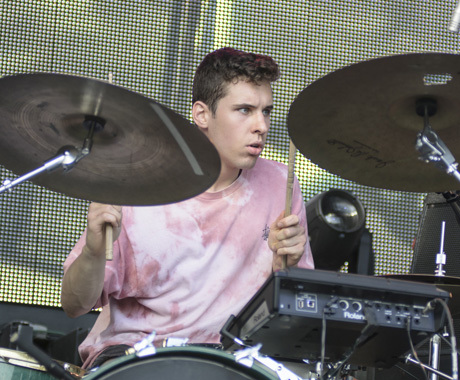 Placed into the 6 p.m. slot, Toronto breakbeat/ jazz combo BADBADNOTGOOD were given the task of warming the crowd up for what would be an epic night of music. Looking more youthful and dewy than they come off on wax, the three former Humber College students — Matthew Tavares on keys, Alexander Sowinski on drums and Ottawa's Chester Hansen on bass — opened their set with an extended version of "Triangle" from their recently released LP, III. Bringing out long-time collaborator Leland Whitty to play tenor sax on their rendition of Flying Lotus's "Putty Boy Strut," the mostly college-aged audience responded with much adoration. Navigating through a tight set that featured mostly originals (the exceptions being their cover of TNGHT's "Bugg'n" and a portion of Gucci Mane's "Lemonade") the three (sometimes four) musicians kept the audience engaged, dancing and eventually moshing, thanks to Sowinski's charming and overpowering stage personality. What could have been simply a early-evening warm up gig had been transformed into a sweaty, energy-fuelled party, thanks to BADBADNOTGOOD's remarkable ability to connect with their fans.